The seclusion and also unanimity of Tibet are reliably one of the principal reasons for all - the partial fabulous descriptions of a large Tibetan dog. After the historical silk road also Tibet is touched it probably correctly that also already in the antiquity on these dogs also in the European hemisphere one reports again and again. The narrations from this time in addition, later the descriptions by Marco Polo over these dogs prove that the travellers nevertheless acquired a certain reverence before them. Already from such reports it is evident that the targeted application of the dogs, i.e. for the protection of the herd, must have not substantially changed the domestic territory and property during this long period. Much however is safe to represent above all in order the own performance in the dangers of such a long journey correctly also painted and exaggerated passed on. The written excessive quantity of a gift to the Chinese emperor around 1121 v. Chr. describes a dog, which in this type surely today no more is not to be found in Tibet. Applies also here: the dog becomes which one from him makes. 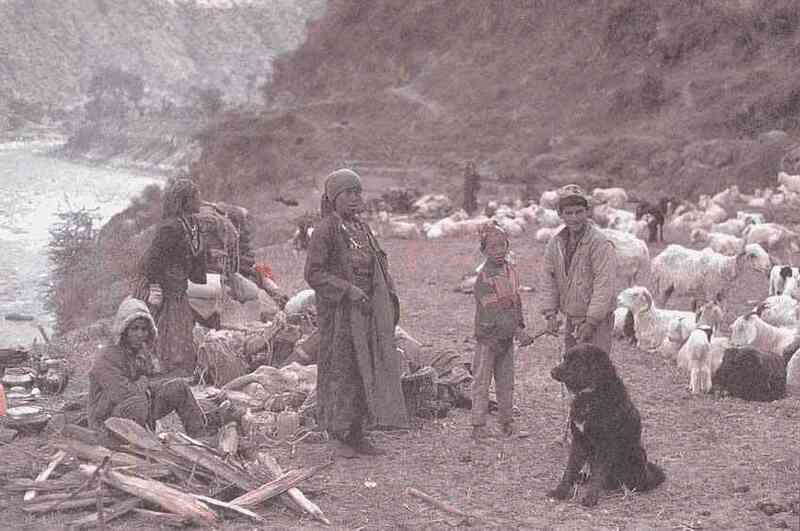 In these seclusion of Tibet under partial life-hostile conditions of nature the farmers, in addition, the pastoral tribe were threats by robbery and theft suspended and like that were desired probably always it the fact that the dogs a safe protection of have and property as well as the life ensured. Whether the DO Khyi was actually the ancestor of the just as legendary Molosser, in addition there are many theses. In addition, the possibility existed it by the trade of the antiquity, is possible that resembled human needs and ways of life the independent emergence of similar dog types promoted. Surely however the homogeneity of the behavior is to be still determined particularly with the Eurasian herd protection dogs also today. 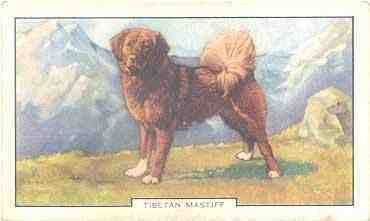 The seclusion of the Tibetan high country has us the Tibet Mastiff keeps a participation in the emergence almost unchanged or other flock-guard breeds can be quite possible. In addition, these theories are to be proven today over 100years after "discovered” the Do Khyi by western cynologists not unique. 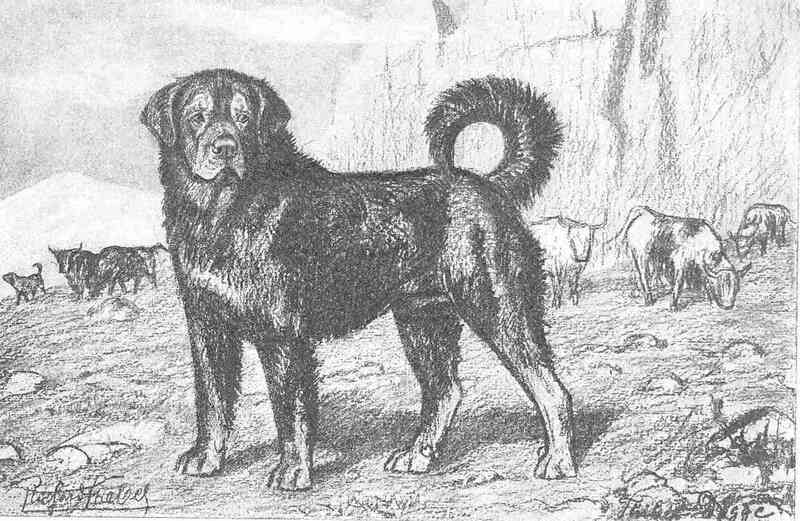 The more importantly it might be the Tibet Mastiff than original race in the physique such as natures to keep as uninfluenced as possible. 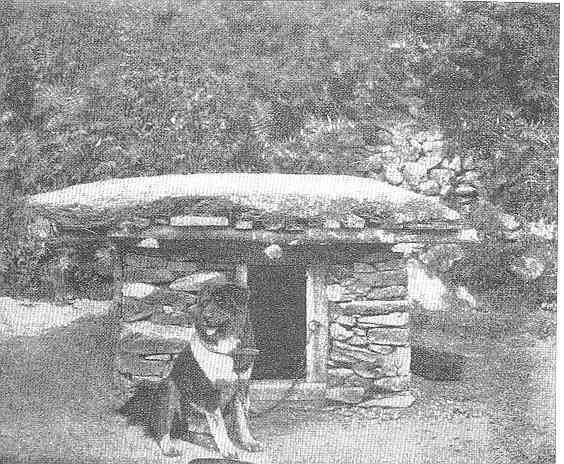 Only over the turn of the century, in the course of the colonize Tibet was travelled, partly under adventurous conditions, often also secretly by Europeans and by the descriptions, as well as by first imported goods of such dogs to Europe large interest in these impressive Do Khyi was aroused. 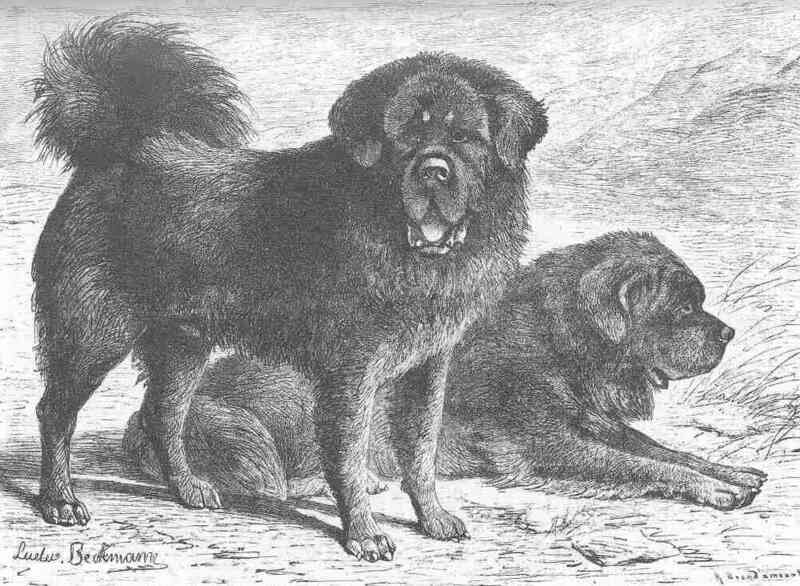 The first representatives of the race were presented under European names in Europe, from this time do result also at all the not correctly introduced names for all Tibetan dog races like the Tibet Terrier, which does not guarantee Terrier is, to the Tibet Spaniel, which does not for the hunt reliably to use , and the Tibet Mastiff or in German the Tibet Dogge which never had this function as the European Mastiffs. 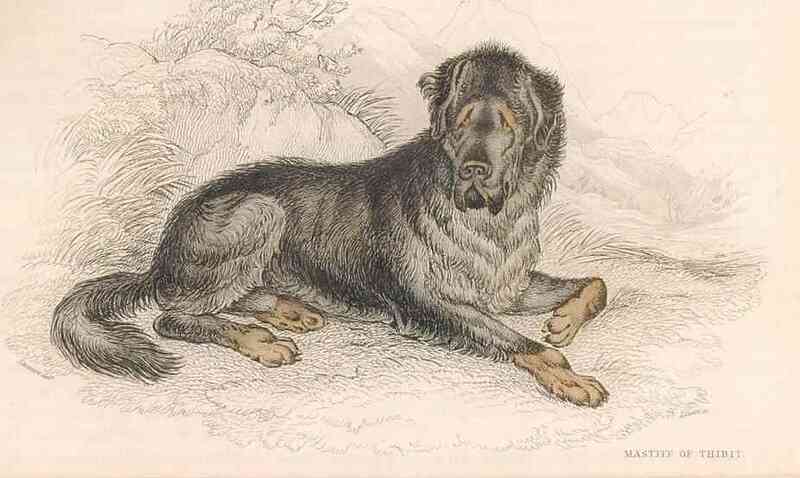 Tibetdogge Richard Strebel 1905 (Heliogravure) fromStrebel " the German dogs"
The in such a way defined Do Khyi is safe also around the turn of the century a imposing, strong dog with stately heading and mastiff-like lips, regarding the legendary size is the disappointment however with the first expert ones largely and already with the cynologists of this time was disputed the made allocation to the Mastiffs and Molosser. Already also an allocation of the Do Khyi to likewise at that time also still the flock guard dogs wide-spread in Europe quite took place around the turn of the century 1900.
above after all many of these imported dogs survived a spending into our low altitudes not for a long time. Often this imported Do Khyi was - at short notice in a the position independently to those quite different conditions of the western civilization not to adapt and came oneself in such a way it that these were delivered into the zoos, in order to live there beside the beasts. The relation of the Europeans to the dog in this time was to be supported reliably not favourably around these animals during the integration into the human household. And nevertheless some Europeans quite detected the peculiar attraction by an intensive linkage and confidence to the family and thus to this breed the chute in Europe enabled. By confusions of the First and Second World War unfortunately the tracks of these first European breed dogs lost, probably also today still another again well making loss for the genetics of this race do not have themselves. Only end of the seventies, for a long time after the beginning of the Holocaust at the Tibetan people, the culture and nature in Tibet by the Chinese Annexation in the year 1950 came the first Do Khyi again by imported goods this time from stocks of the immigrants from Nepal, Bhutan and India to Europe. Many valuable blood lines of the race became extinct by the pursuit of these dogs by the Chinese in Tibet and irreparably lost. After the Do Khyi represents a basis of the rural, nomadic way of life of the Tibetan people is particularly these dogs pursued and killed around to prepare the soil for a new for the Chinese conceptions adapted way of life. Descriptions from my surrounding field according to, could be seen on journeys in Tibet, in the exchange of the University of only recently still many to the Do Khyi similar dogs, which were very badly treated however, usually in the villages, a majority of these dogs might be no longer clear in breed. Only one Do Khyi at a herd of Yaks, which was apparently a splendid specimen. Photographing the same, likewise all other dogs was forbidden by the Chinese travel company. In addition, still goes today from the representatives of this breed, who realize world-wide a quite peculiar attraction on humans, whom the owners of these representatives can acknowledge again and again.